by by Nick Nilsson, C.P.T. Two kinds of movements build big backs: vertical pulls (think chinups and pulldowns) and horizontal pulls (bent over and cable rows). And while working each into your routine will get the job done, there’s no law that says you can’t do both at once for twice the effect in half the time. 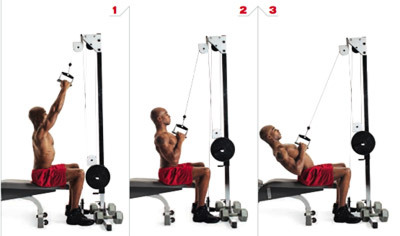 Meet the pulldown-row, a combination of two great back exercises in one. 3. Return to the starting position by slowly raising your arms and torso up simultaneously. That’s one rep. Perform three sets of eight to 10 reps first thing in your upper-body workout. Between sets, rest 60-90 seconds. While it may at first look like bad pulldown form and a sure backbreaker, this combo safely works every muscle in the back, accomplishing both of the back’s main function and broadening it in every direction.